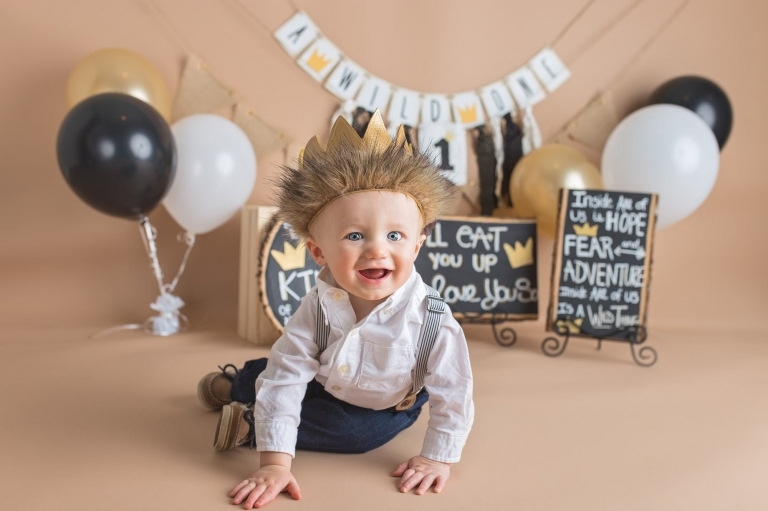 There is no better way to document your baby's first birthday than with custom cake smash pictures! These sessions provide parents with a wonderful keepsake of their baby's first experience eating birthday cake. And they are so much fun! You'll want to capture images of your baby at this sweet and fleeting moment in time; there is no other birthday quiet like their first. 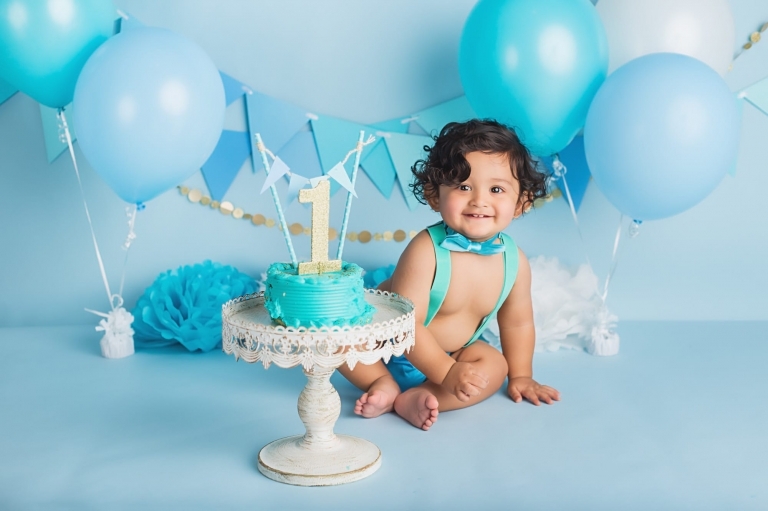 My cake smash photo sessions include multiple setups and styling options that are as unique as the babies being photographed. 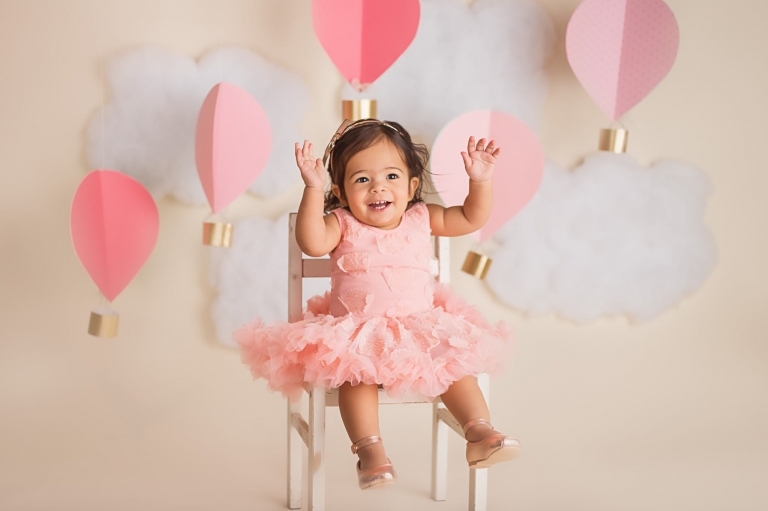 These sessions are highly customized; from colorful backdrops and balloons to personalized banners and other decorations. I work closely with each family to bring their vision to life. Your session takes place in my Randolph, NJ portrait studio and begins with a pre-session consultation. I take the time to get to know you, your baby, and what you envision for your baby's cake smash portrait session. Contact me to learn more and get the process started. A "cake smash" is the name give to a popular trend in portrait photography where babies are photographed with their birthday cake. These sessions are typically scheduled just before their first birthday. It's a wonderful way to commemorate this big milestone! Its called a cake smash because babies are allowed - in fact, encouraged - to smash their cake! Sometimes they get really into it, and cake ends up everywhere. Other times, babies aren't very interested in their cake, at least not at first. They may play with it instead of eating it. They may need a little bit of coaxing to get going. No matter what they do, we capture it all with adorable portraits. How many Setups are Included in A Cake Smash session? I like to provide parents with multiple setups for a cake smash photo session. The first setup includes a neutral-colored backdrop. This is to capture some clean, classic portraits of your baby. I have some simple props for them to sit on or pull themselves up on. The second setup is the smash set. This will include the birthday props and decor we have discussed during the pre-session consultation. First I will take a few more clean photos of baby in the second setup. Then we will bring out the cake and let baby go at it! You will get a variety of images in different outfits and backdrops. Do you provide the props for the cake smash? I do provide the props for your baby's cake smash photo session! The setups can be decorated and styled in a particular theme or color scheme. Alternatively, they can be simple and classy, with minimal props and decor. I always start with a free consultation with the parents to see what they have in mind, hear their ideas, and offer suggestions. Most parents do come with a theme; however, I've also had parents come to me without any specific ideas. Don't worry, I will lend my expertise and work with you to develop something you will love. Sometimes parents will bring a few props of their own. 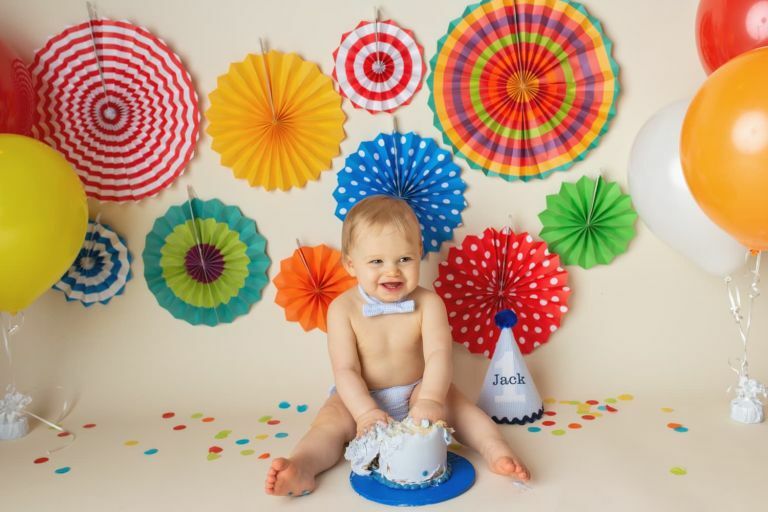 If you are ordering a custom banner or other decor to use at your baby's birthday party, these can make excellent props for the cake smash photo shoot. I do ask parents to bring their own cake, due to food allergies. I can supply recommended bakeries and tips for finding the perfect cake. 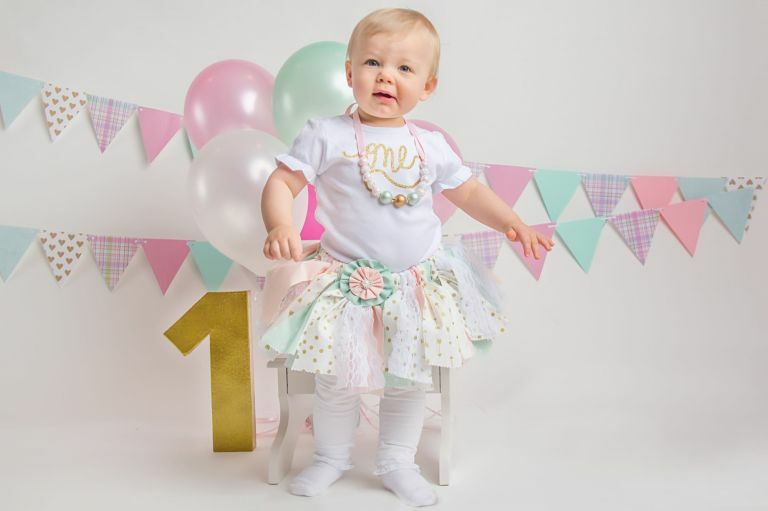 WHAT SHOULD MY BABY WEAR FOR THEIR cake smash PHOTO SHOOT? For the first setup in your baby's portrait session, parents can choose an outfit from my boutique wardrobe collection for babies. I have an adorable selection of unique and handmade outfits for boys and girls that fit babies in size ranges 6-18 months. For the second setup, I do ask parents to provide the smash outfit. This can simply be a diaper cover, pants or shorts, or a tutu skirt for girls. We can discuss outfit ideas and recommendations during your pre-session consultation. It is important to me that babies feel comfortable and happy during their photo session. I always start by letting both parents and babies settle in upon arriving. My studio is a calm, welcoming environment, and I keep plenty of baby toys on hand and stream nursery rhyme music on the speakers. Once baby has warmed up and is ready to start, we will begin photographing. I may do goofy things to get baby to smile; I invite you to be goofy with me! Singing, clapping, and dancing are all encouraged. I work quickly so as to not tire out baby or lose their interest. After the first set, we may take a quick break before moving onto the second set if needed. This could be a good time for a diaper and/or clothing change, or a quick snack for baby. Next up is the smash set with the cake. I recommend that parents let babies approach the cake on their own. It is ok to show baby what the cake is, and help them take their first taste if needed. I let baby lead the remainder of the session and continue to photograph until they are done. Once baby is done, you can clean them up in my studio bathroom. There are plenty of wipes, baby wash and towels on hand to clean up afterwards.